Spectacles Case / Sunglasses Case. 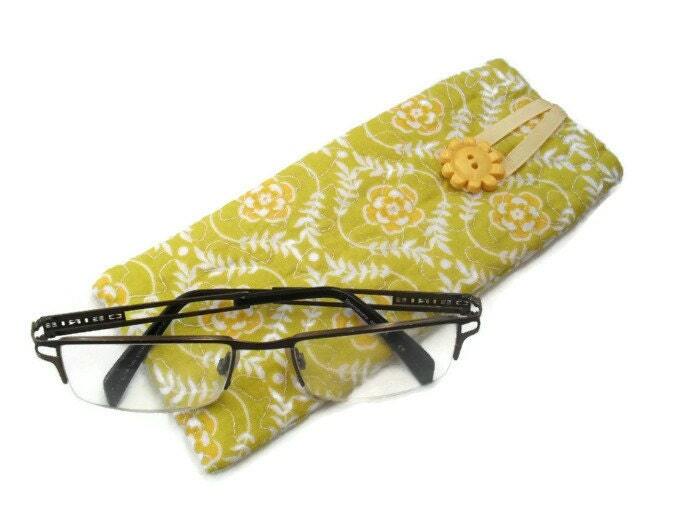 This charming glasses case is handmade by me in 100% cotton. It is padded and features a contrast lining. The outer fabric is in a lovely yellow design and the inner is a plain beige. The closure is a yellow, flower button and lemon ribbon loop. What better way to protect your glasses from scratches? This case measures approx 18cm x 8cm and will fit even large size sunnies. This listing is for the case only (glasses not included). I can make to order in other colours and fabrics, just contact me with your requirements.